For breakfast this morning, I enjoyed a peanut butter and jelly sandwich and a banana, not pictured. Lunch was provided by a drug rep today at work. I had a chicken salad wrap with a salad with dried cranberries, goat cheese, walnuts, and a really good (and very unhealthy) balsamic vinaigrette. I forgot to take a picture until I was finished... But trust me. It was good! And free lunch is always better then regular lunch. I also scheduled my appointment for my laser hair removal for next Thursday. I'm super excited. Bye Bye Razors!! Last night while watching Chopped, Huck decided we were going to have a chopped challenge at home. On the show, chefs are give a basket with 3-4 mystery ingredients they must incorporate into one dish. They use some pretty crazy combinations on the show, so I was scared to see what Huck was going to buy. I had to use all the ingredients in the basket. I can use anything in the pantry or fridge. He place all the ingredients into a "basket". I'm still red from the gym in all these pictures. I opened up my basket and was really surprised with what I found inside. I have never cooked a fresh artichoke before, either, and really had no idea how to cook it. I cut the artichoke in half, removed the choke, and boil one half and baked the other half at 450 degrees. I'm not sure if I did not cook it properly, but it was very woody/tough. I went over my one hour time frame by 3 minutes, but I made a three coarse meal instead of just one dish. For my first course, I made a Sharon Fruit and Fish Won Ton Soup. I chopped some of the Sharon fruit, ginger, garlic, and catfish together in my Slap Chop. I added about a teaspoon of the mixture to each won ton wrapper and sealed them shut with a little egg whites. I cooked the won tons in two cups of beef stock for 3-5 minutes . For the main course, I dipped the fish in an egg wash and breaded them with Panko bread crumbs, salt, and pepper. I cooked them with vegetable oil until done. For the side dish, I made a vegetable medley with broccoli, sugar snap peas, Sharon fruit, chickpeas, and teriyaki sauce. Meghann at Meals and Miles had a recipe with vegetables and chickpeas last week. For some reason it came to mind when I was trying to figure out what to do. And last but not least, dessert. I finely chopped some of the Sharon fruit and added them into the Won Ton wrapper and pan fried in a little oil. I then added a little water and covered with a lid so the won ton could steam. I served them with melted chocolate and powdered sugar. This fish was so crispy! I think it was my favorite part. 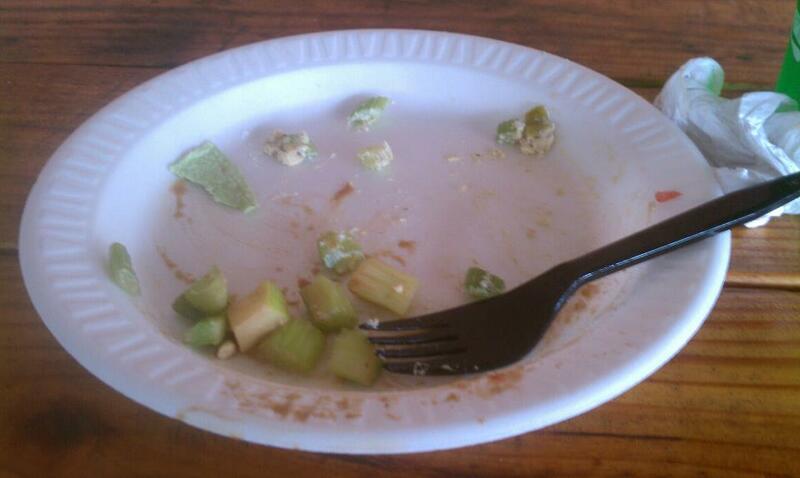 I did not like the artichoke. I am not sure if I just didn't cook them right, but they were way to woody. I just added a few pieces to the soup. I would have been Chopped for sure! I presented the food to Huck Chopped style. I really do not have a recipe since I was throwing stuff together, and winging it as I was going. I plan to research the proper way to cook an artichoke, though. I think the dessert would be really good with strawberries instead of the sharon fruit. Sounds like a good Valentines Day dessert. Tonight was a lot of fun. I cooked with food I wouldn't normal use and experimented with different techniques. Huck told me he wants to do this again next week. He enjoys challenging me and seeing what I can come up with. Well this is my third WIAW Love Your Veggie Month and first Chopped Challenge all in one. If anyone has a recipe for Sharon Fruit or Artichokes, please share!! i've ALWAYS wanted to do a chopped challenge in real life! how funnn! It was so much fun! You should try it! It is a great way to try new foods or regular food different ways.